Relationships between employers and employees are regulated under various federal laws. It is essential to be aware of these regulations. Those who violate their provisions risk lawsuits and penalties for failure to comply. Under the Family Medical Leave Act, or FMLA, an employee is afforded up to 12 weeks of unpaid leave to recover from pregnancy, serious illness, or to aid a sick family member. No adverse employment actions are permitted upon return. That means after 12 weeks of such leave, an employee must be permitted to return to their previous position with no reduction of hours or pay. The federal minimum wage is presently $7.25 an hour. Some local governments have increased the minimum wage above the federal level. For non-salaried, non-commissioned employees, an employer is required to pay one and a half times the normal hourly wage for any hours worked in excess of 40 hours a week. An employee has the right to work in a place free from harassment and discrimination. Sexual harassment can take the form of unwelcome sexual advances or a hostile work environment. Adverse employment actions taken for the reason of race, religion, gender, and in some states, sexual orientation, may result in a lawsuit. It is also against the law for an employee who files a lawsuit for workplace discrimination, sexual harassment or another wrong doing to face retaliation for whistleblowing. Under Federal Occupational Safety and Health Administration (OSHA) regulations, an employee has the right to work in an environment free of dangerous conditions, safety hazards and toxic substances. Employees dealing with potentially dangerous equipment must be trained to use it safely, and all employees should undergo training on workplace safety. The OSHA handbook has 19 subsections, each dealing with a specific topic such as fire prevention, heavy machinery, hazardous materials and walking/working surfaces. 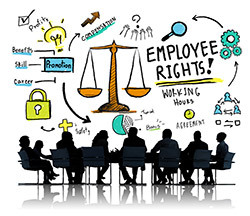 The National Labor Rights Act, or NLRA, allows employees to organize a union to negotiate working conditions and compensation through collective bargaining and the use of strikes. The NLRA does not apply to public employees, domestic employees, agricultural employees, railroad employees, airline employees, supervisors, management, independent contractors or close relatives of the owners of the company that employs them.